Error: 0x800f081f The source files could not be found. Use the "Source" option to specify the location of the files that are required to restore the feature. For more information on specifying a source location, see http://go.microsoft.com/fwlink/?LinkId=243077. 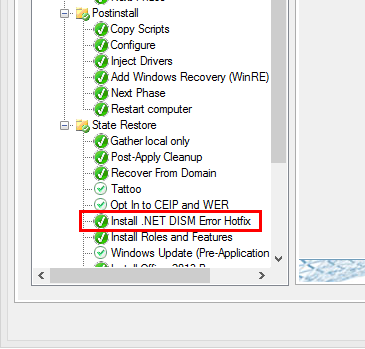 MDT has been capable of installing Roles and Features in 8.x since MDT 2012 Update 1, and my setup had previously worked. After much searching around, it turns out there’s an issue if some security updates have been installed before the .NET Framework 3.5 is installed. Microsoft have released this update to resolve the issue. 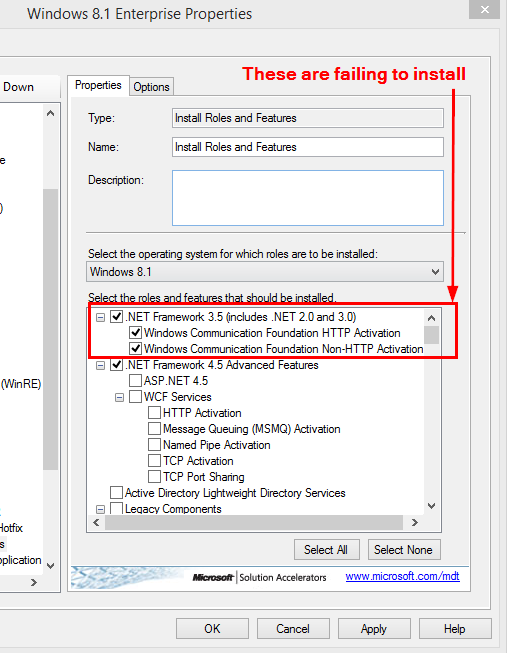 It simply uninstalls the security updates, thereby allowing the .NET Framework to install successfully. I added the hotfix into MDT as an application, and inserted it into the task sequence just prior to the Install Roles and Features step. Problem solved. If your machines aren’t automatically having their display resolution set to their monitor’s native resolution after deployment via MDT, this may be the cause of the problem. Although I’d previously deployed Vista and Windows 7 using MDT 2010, I’d never seen this problem. The issue occurred with a captured HP ProBook x86 Windows 7 Professional build. I had to edit the unattend.xml for the task sequence in question, and delete the Display section from oobeSystem –> x86_Microsoft-Windows-Shell-Setup_neutral. Once this was done, the strange default of 1024 x 768 (where did that come from?) was no longer applied, and Windows Setup detected and set the maximum resolution.